Big news: In an effort to regain its low-price leader status, Walmart now has prices that rival Amazon. 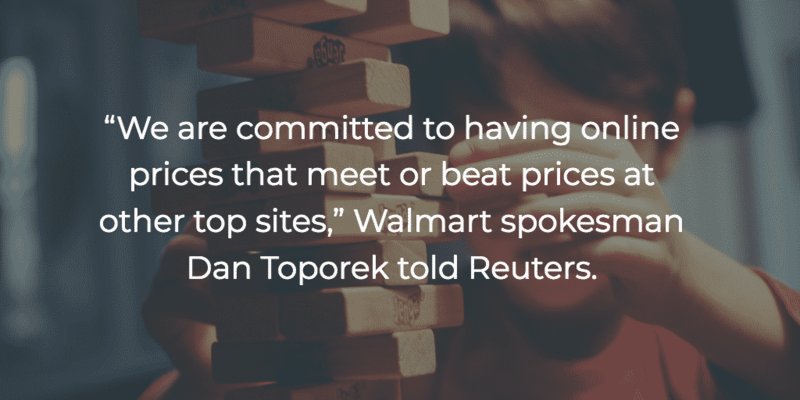 A recent price study by retail data analytics firm Market Track showed that Walmart’s products currently cost an average of just 0.3% more than Amazon’s, Reuters reports. By comparison, during the first half of the 700-day study — in which Market Track analyzed 213 products in 11 categories — Walmart prices cost 3% more than Amazon’s. Along with intel from pricing experts, retail consultants, vendors, and company sources, the study illuminates that across a broad range of online product categories, including TVs, toys and games, headphones, and sports and outdoors, the gap between Walmart’s prices and Amazon’s prices is narrowing. Among other benefits, this means that Walmart online can now offer the low prices that originally established the company as a retail leader. For example, in wearables, a category that includes things like fitness trackers and smart watches, Walmart’s prices are 6.4 percent lower than Amazon’s compared, to 12.6 percent higher at the same time a year ago. For sports and outdoor products, Walmart is now 1.3 percent lower compared to 3.5 percent higher one year ago. Changes like these, where prices have been lowered and maintained on several products over time, show how the retailer has been able to sustain price drops across categories, making offerings consistently competitive with Amazon. Walmart continues to blur the line between the offline and ecommerce shopper experience, making the case for why retail is far from dead. Retailers that implement a diversified strategy, connecting brick-and-mortar to online expectations, stand to win more sales across every channel in the long term. The best omnichannel retailers are constantly aligning what shoppers encounter in physical locations with what they get online. That’s because the shopper today is channel-agnostic. Criteo’s latest Shopper Story research revealed that more than 75% of shoppers engage in online to offline and offline to online shopping. You only have to look at Walmart’s playbook to see how this plays out. Aside from price optimization, the retailers has been making tactical acquisitions to expand different product lines and offer free-two day shipping. In the coming years, the retailers that constantly push for new changes and new thinking will be the ones that succeed in the changing landscape. Walmart’s constant experimentation has clearly led to a revitalized online-offline presence, and other brands should take a look at the retailer’s playbook to learn where it might be possible to compete in the future. For more omnishopping insights and how retailers can rise to the challenge, check out our Shopper Story report.